U.S. Bank recently donated $2,500 to the Fayette County YMCA with their Foundation. Pictured (L to R): Jessica Colburn (U.S. Bank), Doug Sanders (YMCA), and Kelli Brown (U.S. Bank). https://www.recordherald.com/wp-content/uploads/sites/27/2017/07/web1_FullSizeR-1.jpgU.S. 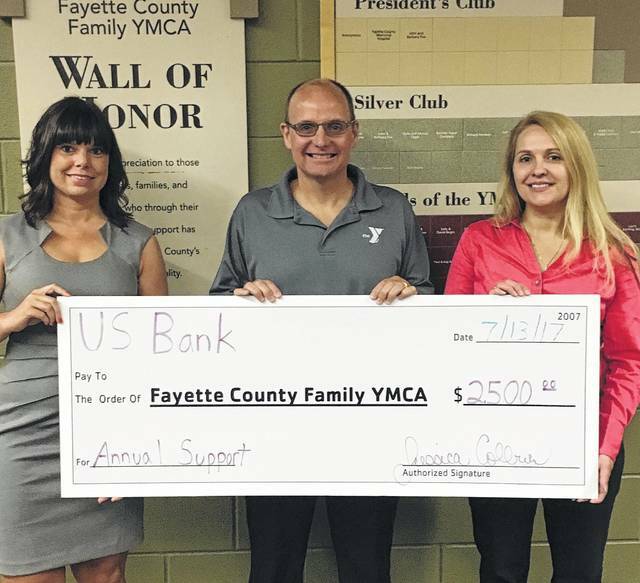 Bank recently donated $2,500 to the Fayette County YMCA with their Foundation. Pictured (L to R): Jessica Colburn (U.S. Bank), Doug Sanders (YMCA), and Kelli Brown (U.S. Bank).